King Mahanama while ruling India, fell in love with one of his slave women who bore a daughter for the king. The king named his daughter Wasabhaththiya. After she attained age the king gave her in marriage to king Kosol. After some time Wasabhaththiya bore a son called Widudaha for King Kosol. After Widudaha grew up he was made the deputy king. When King Kosol learnt that Wasabhaththiya is a daughter of a slave woman, he expelled both mother and the son from their royal obligations. Lord Buddha who was staying at Devram Vihara in Savath Nuwara learnt of the case and visited the king’s palace. The Buddha explained to the king. “Great king, Wasabhaththiya is not a woman of low caste. She is the daughter of king Mahanama and her son has your blood. Therefore don’t you think that this mother and son have a royal lineage?” “Yes Sir, I agree with you”. The king replied with veneration to the Buddha. “Then, great king, how can your son be prevented from inheriting the kingdom which belongs to his father?” The Buddha paused for a while and spoke : “O, great king!, not only in this birth, you have acted in a not so responsible manner in previous births as well”. 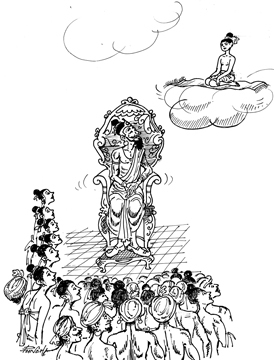 Upon a request made by the king Kosol, the Lord Buddha preached the Kattahari Jathaka story for everyone present. Once upon a time in Veranasi, India, a king named Brahmadatta was ruling the country. He was easy-going and his favourite hobby was hunting. He also had the desire to show off his ability to hunt animals who are comparatively faster than him. One day when the king was on a hunting spree with the fellow hunters, he happened to hear a song rendered by a woman. King stealthily strode towards the direction where the music was coming from. The young woman became more scared on hearing that. “O, great king, please forgive me if I have done or said something wrong,” and she paid obeisance to the king. “Dear pretty lass, I am mesmerized by your beauty. I cannot think of anything else. I shall marry you, pretty lass,” and so the king expressed his feelings. The woman though coy and afraid, was also attracted to the king. She then coyly said, “but, great king there are many rituals to be done before the marriage. You cannot marry me at this moment. Let’s do that first before you make me your consort.” “But pretty lass, I have no patience. I want you now”. The king said and the young woman too succumbed to her feelings as they could not resist themselves. At that moment Bodhisatva was conceived in the woman’s womb. The king gave his priceless glittering ring which was on his finger and said, “dear lass, if you bear me a daughter, you may sell this ring and nourish her. In case you bear a son, you come to me with this ring so that I would recognize you.” The royal hunters went in search of the king since he had failed to return by sunset. When he saw the fellow hunters coming towards them, the king took leave from the woman and rejoined the team. The woman went home and told her mother all what had taken place between her and the king. After nine months she bore him a son. He was a sweet little child with exceptional qualities. Though the king remembered the woman and that they made love in the jungle, he was ashamed to accept the fact. “Chase this woman and the little one out. I have no time to entertain these type of people”, the king ordered. “I do not have any evidence to prove that this child is yours. I only have the power of my Satya Kriya to prove it. I will throw my son upwards. If the son is not yours he would fall down and die, if he is yours he should stay in the air without falling”, said the woman and threw her son up. The Bodhisatva who was the son of the peasant woman and the king Brahmadatta, with his psychic powers stayed in the air without falling down. The Bodhisatva said. “Great king, as you are the guardian of the people of the entire country, you are my guardian too”. That impressed the king and invited the child to descend. “Ok, I will be your guardian”, the king said. “Dear king, I do not want a guardian, I need a father”, said the Bodhisatva. “I will be your guardian as well as the father”, assured the king. Though many people extended their hand to take the baby into their hands, the Bodhisatva only came to the hands of the king and sat on the king’s lap. Then the king declared the marriage between the mother of the baby and him and the king. When the prince reached the age of sixteen he was made the deputy king and he succeeded king Brahmadatta as king Kattawahana.The king Kosol was born as King Brahmadatta in that birth and the Bodhisatva was born as his son king Kattawahana.